The 22-acre lake provides recreational opportunities such as swimming on a sand beach, boating (row or electric motors only), fishing (including ice fishing), bird watching or just plain relaxing. The lake is regularly stocked with trout that provide enjoyment for many. Three picnic pavilions are available for reservations year-round. If not reserved, all pavilions are available for use on a first-come, first-serve basis. Located only 12 miles south of State College, the park is easily reached by turning east off of PA 26 at the Whipple Dam State Park sign.300-foot sand beach is open from late-May to mid-September, 8 am to sunset. There is also a lap lane available for those who like to swim uninterrupted. There are no lifeguards on duty so visitors swim at their own risk. A dressing stockade, sand volleyball court and snack bar are also available. The 300-foot sand beach is open from late-May to mid-September, 8 am to sunset. There is also a lap lane available for those who like to swim uninterrupted. There are no lifeguards on duty so visitors swim at their own risk. A dressing stockade, sand volleyball court and snack bar are also available. The 300-foot sand beach is open from late-May to mid-September, 8 am to sunset. There is also a lap lane available for those who like to swim uninterrupted. There are no lifeguards on duty so visitors swim at their own risk. A dressing stockade, sand volleyball court and snack bar are also available. Best of all, to enter the park and use the facilities is Completely Free! You can often have the lake to yourself early in the morning. This pavilion could be yours for the day! 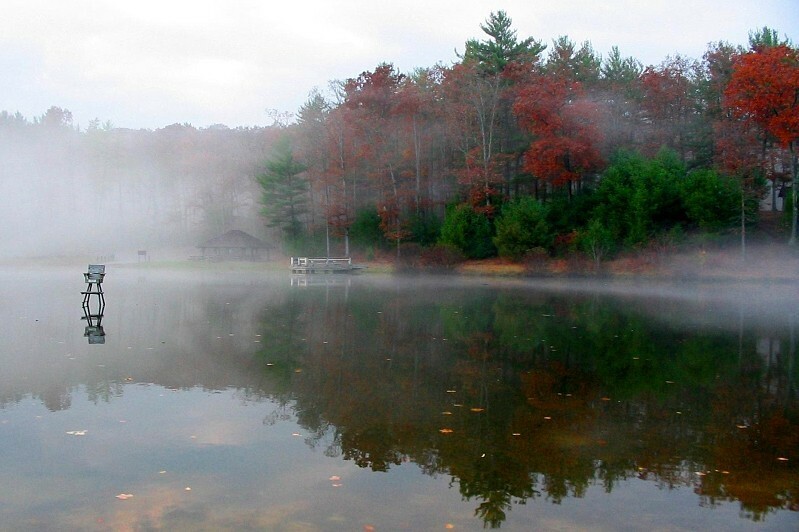 Surrounded by Rothrock State Forest in the northeast corner of Huntingdon County, this 256-acre state park is a delightful and quiet place to visit. The park area was originally purchased from the Iroquois Confederation by the Proprietary Government of Pennsylvania on July 6, 1754. The land eventually became a part of the Monroe Iron Works, a few miles to the north. Charcoal was produced in the area for use in the iron furnace, and there is evidence of iron ore mining. In 1868, Osgood M. Whipple purchased a large block of land and constructed a dam and sawmill downstream from the current park dam. Whipple left the lumber business in 1897 but the dam remained for many years and was know locally as "Whipple's Dam." Between 1933 and 1941, the Civilian Conservation Corps (CCC) had a work camp at Owl's Gap, east of the park. The corps members built pavilions, roads, beach and restrooms during this time. In 1935, the CCC dismantled the old dam and constructed the existing dam and bridge. In 1987, the 32 -acre park day use area was designated the Whipple Dam National Historic District. This entry on the National Register of Historic Places recognizes, protects, and preserves the worksite of one of the Depression-Era's most important relief programs, the CCC.